I have had the good fortune of reading some exceptional and life changing books as a result of my Adult Education and Training Master's program. On this page you will find a selection of these books, my review and reflection of them and the impact that they have made on my teaching and learning. The first book that I read at the start of my AET / Adult Education & Training program was John Dewey's Experience and Education. At first I found this book to be challenging to read and I needed to read it several times. I later discovered that this book is considered to be one of the "Great Books" and that struggling to read one of these promotes deeper learning. Soon I found that I enjoyed re-reading this book several times and that each time I reflected on it, I gained deeper insights. 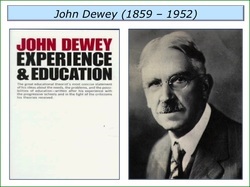 John Dewey's words of wisdom in Experience & Education has had a profound impact on my teaching. Whenever I design instruction, I remember Dewey's words that, "the belief that all genuine education comes about through experience does not mean that all experiences are genuinely or equally educative" (Dewey, 1938, p. 25). Dewey's words ring in my ears, with every lesson and training that I develop. It causes me to pause and ask why I am including an activity and what impact will it have on the learning and the learners. Below you will find my reflection paper on this 'Great Book' and read about how it has influenced my teaching. I have also included a power point on the "Great Books". I deeply connected to Palmer's 2007 inspirational book "The Courage to Teach". Initially I did not fully realize how much courage it takes to teach until I read this book and reflected on my own teaching and learning. Palmer tells us that "teachers possess the power to create conditions that can help students learn a great deal or keep them from learning much at all (Palmer 2007, p.7). I completely agree with this statement and feel that as Teacher's we have a responsibility in fueling the fire and love of learning or completely dampening it. As I take the responsibility of teaching seriously and desire to be the best that I can, I pursued both a certificate in Adult Education and a Master in Education in Adult Education and Training. I thought that I would learn a number of techniques and strategies to effectively teach, which I did. However, Palmer stresses that teaching goes beyond techniques and that we teach who we are. These words have resonated with me and given me the incentive to truly teach from my heart and share who I am and my experiences with the learners. This has been well received by learners and has promoted deeper connections, understanding, and trust. You may read about my review of The Courage to Teach (2007) and the impact that it has had on my teaching below. Age Discrimination impacts everyone. I have devoted a great deal of my career to dispelling myths about older workers and encouraging employers to discard inaccurate images and focus on talent and skill. It is not only Older Workers who are impacted by Age Discrimination but also employees of all ages as well as employers who may miss opportunities to utilize the skills and capabilities of many talented employees. Below you will find my Book Review of Raymond Gregory's Age Discrimination in the American Workplace. I invite you to view my upcoming book blog and join me in discussion about "What the Best College Teachers Do", available November 2014. I have always valued the power of reflection to enhance learning. When we share our reflections that power is tenfold as we learn from each other and examine other perspectives. I look forward to sharing reflections and learning with you as we dialogue on what the best college teachers do so that we can be the best college teachers that we can!